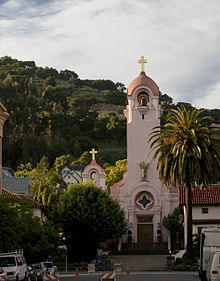 Marin County /məˈrɪn/ is a county located in the San Francisco Bay Area of the U.S. state of California. As of the 2010 census, the population was 252,409. Its county seat is San Rafael. Marin County is included in the San Francisco- Oakland- Hayward, CA Metropolitan Statistical Area (San Francisco Bay Area) across the Golden Gate Bridge from San Francisco. As of 2010, Marin County had the fifth highest income per capita in the United States at $91,483. [ needs update] The county is governed by the Marin County Board of Supervisors. The county is also well known for its natural environment[ citation needed] and liberal politics. San Quentin State Prison is located in the county, as is George Lucas' Skywalker Ranch. Autodesk, the publisher of AutoCAD, is also located there, as well as numerous other high-tech companies. The Marin County Civic Center was designed by Frank Lloyd Wright and draws thousands of visitors a year to guided tours of its arch and atrium design. In 1994, a new county jail facility was embedded into the hillside nearby. Marin County's natural sites include the Muir Woods redwood forest, the Marin Headlands, Stinson Beach, the Point Reyes National Seashore, and Mount Tamalpais. Notably, the Lagunitas Creek Watershed is home to the largest remaining wild run of Coho salmon (Oncorhynchus kisutch) in Central California. These coho are part of the "Central California Coast Evolutionarily Significant Unit, " or CCC ESU, and are listed as "endangered" at both the state and federal level. As of the census  of 2000, there were 247,289 people, 100,650 households, and 60,691 families residing in the county. The population density was 476 people per square mile (184/km²). There were 104,990 housing units at an average density of 202 per square mile (78/km²). The racial makeup of the county was 84.0% White, 2.9% Black or African American, 0.4% Native American, 4.5% Asian, 0.2% Pacific Islander, 4.5% from other races, and 3.5% from two or more races. 11.1% of the population were Hispanic or Latino of any race. In the United States House of Representatives, Marin County is in California's 2nd congressional district, represented by Democrat Jared Huffman. From 2008 to 2012, Huffman represented Marin County in the California State Assembly. According to the California Secretary of State, as of February 10, 2019, Marin County has 161,870 registered voters. Of those, 89,526 (55.31%) are registered Democrats, 23,380 (14.44%) are registered Republicans, 7,020 (4.35%) are registered with other political parties, and 41,908 (25.89%) have declined to state a political party. Democrats hold wide voter-registration majorities in all political subdivisions in Marin County. Democrats' largest registration advantage in Marin is in the town of Fairfax, wherein there are only 344 Republicans (6.1%) out of 5,678 total voters compared to 3,758 Democrats (66.2%) and 1,276 voters who have declined to state a political party (22.5%). Marin County Free Library is the county library system. It is headquartered in San Rafael. In addition, the Belvedere-Tiburon Library is located in Tiburon. Marin Magazine , a monthly lifestyle magazine with headquarters in Sausalito. Marin Local Music,  Music listings for Marin's Restaurants & Venues who host live music. ^ " San Quentin State Prison." California Department of Corrections and Rehabilitation. Retrieved September 12, 2010. ^ " Contact Us." Marin County Free Library. Retrieved on May 4, 2009.